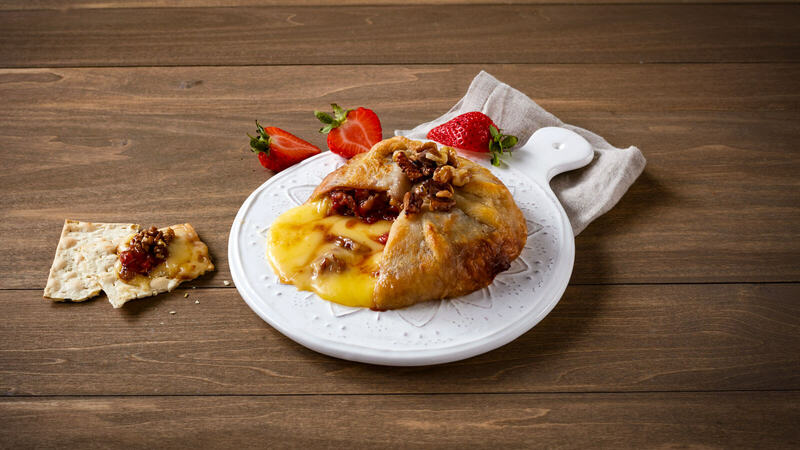 Delicious soft-ripened cheese, wrapped in a buttery puff pastry with sweet strawberry preserves and crunchy walnuts. Please select the number of take and bake bries you wish to order, and the item total will show in your shopping basket. Requires baking: Pre-Heat oven to 425 degrees. Place on lightly greased cookie sheet and bake for 20-25 minutes or until pastry is golden brown. Allow to rest for 2 minutes before serving. Serving Size: A 12 oz. take and bake brie should serve 4 to 6 guests.